In October 2009, Ping Wang worked at the zoo restaurant in Chongqing, China, at the edge of Szechuan Province. John Braun was in town on holiday from his teaching gig elsewhere in the country, playing mah-jongg with a group that included Wang's sister. The sister thought Wang and Braun would make a good match. "She called up Ping," Braun recalls, "and said, 'You have to meet this guy!' [Ping] came down and we toured the mountains and rivers," Braun says. "I was smitten. I decided to move to Chongqing." Wang and Braun married in March 2010 after a whirlwind courtship. Four years later, they live in Rochester, Vt. Their restaurant, Ping Wang's Green Mountain Chinese, occupies the clubhouse of the White River Golf Club. One recent afternoon, Braun — a 77-year-old former active-duty Marine wearing jeans and a "USA" T-shirt — brings two Switchbacks to my table. (The beers, my husband, Dan, and I will learn, beautifully complement spicy Szechuan food.) Braun wanders to the entryway and calls, "Ping!" into an adjacent hall. "These people want to meet you." He turns back to Dan and me: "Her city is famous for two things: spicy food and beautiful women." Wang enters, wearing black capris and an apron. Her dark hair is pulled into a ponytail. She says she's 53 but looks a decade younger. Wang speaks broken, heavily accented English, and her wide smile offers a warm welcome. Braun translates as they tell their story. The couple moved to Vermont in 2012 after three years in Chongqing. Braun is from Pennsylvania, but his daughter teaches kindergarten in Rochester. He says Wang "always wanted to travel," and, after they met, "the idea really gained substance." When she met Braun, Wang says, she had worked in restaurants in Shanghai, Guiyang and Chongqing for more than 20 years but dreamed of opening her own place. Moving to the States forced the issue. "I couldn't find food for me," she recalls. "I thought, Maybe I need a restaurant." Braun recounts their first stateside meal, at a diner. "I was scanning the menu for something that would work for her," he says. Ultimately, he went with a plate of home fries, which Wang ate after dousing them with nearly a whole bottle of Tabasco sauce. "I like lots of spice!" she says with a laugh. In Rochester, the couple leased the first floor of the golf clubhouse. The restaurant was out of commission, but it offered a cozy living space with a roomy, well-equipped commercial kitchen. A small bar and dining room overlook the nine-hole course, its prim greens separated by rows of stately white pines. The pair set up shop in late 2012 and opened the restaurant in February 2013. Takeout is their bread and butter. "We're not designed as a restaurant," Braun explains. "We're a take-out place that also has seating. There is a difference." Still, he tends the bar — wine and beer in bottles and cans — while Wang carries food to a handful of long, rectangular tables. Guests eat from paper plates with disposable chopsticks. Braun says he helped Wang tailor the menu to American tastes, but the food is pure Chinese: a mix of traditional dishes and Wang's own creations. "She cooks the same way here as she did in China," Braun says. "That's what people like about it. It's not American Chinese food ... It's Chinese Chinese food." Szechuan food is known for its peppery kick, but Wang prepares orders on a spice scale of 1 to 10. Though Dan and I choose a 2 to appease his sensitive tongue, our meal still packs a respectable punch. Once we order, Wang gets busy in the kitchen. Scents of garlic and ginger waft from behind the swinging kitchen door, and our hostess brings super-crisp, savory spring rolls stuffed with cabbage, carrot and bits of pork. Her dumplings' skins come blistered to a brittle crackle. Long beef skewers, marinated in sweet teriyaki sauce, are so tender that you scarcely have to chew them — though doing so unleashes layers of delicate spice. "Ping understands flavor like no one I've ever encountered in my life," Braun says. "She brings out the food and you're like, 'This is too much, I can't eat this.' Then, before you know it, it's gone." 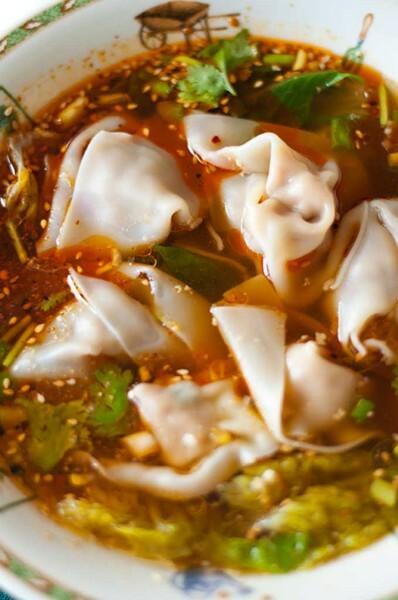 Wang brings two bowls of broth, in one of which those same fat, pork-stuffed dumplings are bobbing, steamed this time; another holds a swirl of rice vermicelli. Sparkling beads of chile oil merge into a red ring around the bowl's edge, broken by flecks of garlic, ginger, scallion and cilantro. We nod eagerly, shoveling noodles and dumplings into our mouths with chopsticks and shamelessly slurping the soup. She beams. "I'm really happy when I'm cooking," Wang says. "I like making food that's good for the body." She looks on for another moment, then returns to her work. Braun explains that his wife calls on generations of Chinese culinary wisdom and lore to create healthful, big-picture meals. She also makes her own noodles. "In China, everybody knows how to make noodles," Wang says later. "When you're cooking, you want to make everything yourself." She says she finds spices and specialty ingredients at 99 Asian Market & Eatery in Burlington. When Braun mentions her knife, Wang laughs. "You wanna see my knife?" she asks. She dashes into the kitchen and returns seconds later with a massive cleaver. "I use this knife!" That brings more laughter, and Wang retires to finish our meal. I join her, watching her work the huge, blocky hacker. Using her wrist to control the action, she sends scallions, cilantro and ginger to the knife, mincing them all into tiny bits. Wang moves quickly, efficiently, almost floating through the space. She looks tiny beneath the cavernous stove hood, but at home working over a stainless-steel table amid towers of take-out containers stacked into wall shelving. At the back of the room, deep basins form a dish line; above these hang gleaming ladles, spatulas, spoons and tongs. It's a one-woman show. "I do everything," Wang says. "Clean [the] kitchen; wash the floors. The dishes." "We have just one wok," Braun says later. "Everything's made from scratch, [but] she can move pretty fast when we get busy." On a busy night, he says, his wife personally prepares up to 70 dishes. 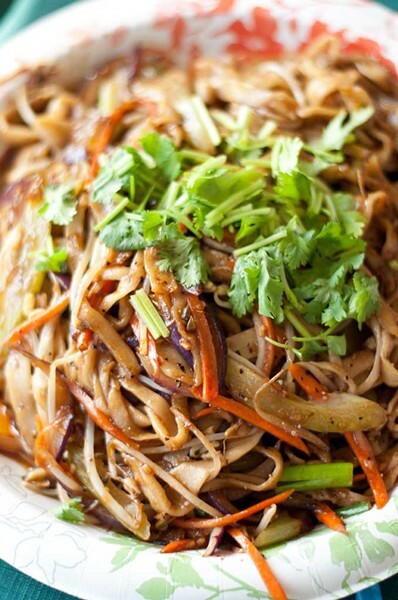 Wang fires off the rest of our food — chewy, hand-cut chow mein noodles tossed in brown gravy with bright, beautiful vegetables; and Szechuan-style peanut chicken swimming in a dark, winey sauce with whole peanuts, scallions and plenty of spice. Braun brings a plastic container of cucumber salad, steeped in rice vinegar with red onion, scallion and cilantro and slicked with chile oil. "Treat this stuff like it's nitroglycerin," he advises, handing me extra oil for good measure. Wang smiles, silent behind the bar, where she's paused to wash her hands. "You like?" she asks again, drying her hands with a towel. Again we nod, mouths full of food. After all that cooking, she's barely broken a sweat, though Dan is starting to perspire from the peppers. "This place is going to turn into a madhouse," Braun says, watching as the parking lot fills with golfers for a 5:30 tee time. On weeknights, he says, the rush begins around 5 p.m., golf or no golf. As if on cue, the phone rings. "Chicken and peanuts? Yeah," Braun says into the receiver. "Ping! Gong bao. And cucumber salad? That's OK, we'll make the chicken and when you come and get it, you can decide." He hangs up. "Ping. Rick wants gong bao." Just like that, the evening shift begins. A few older men wander in — players to check their starting hole, some just to drink at the bar. Wang heads for the kitchen as the golfers take the field, the sun blazing from a humid, cloud-dappled sky. The fairway blurs pale green in the distance, fading into the steep, emerald hills of the Green Mountain National Forest. Rick arrives and greets Wang warmly as she delivers his food. Braun cracks him a beer. Golfers linger, and the place feels like a living room. Our meal ends with a huge chocolate chip cookie. "Ping wanted to give you each a cookie as a gift," Braun says, "To thank you for coming in." "Wow!" I say. "She didn't have to—"
He won't let me finish. "She loves to do that," he says, "to give away little free things." Braun says Wang came up with the recipe after seeing similar cookies at the store. "She saw the price and was like, 'I can make these' ... She never made chocolate chip cookies in her life before she came here." The cookies are six for $5, feather light and crusty, chewy, buttery and flakey all at once. "The owner of the golf club is addicted to these cookies," Braun says. "He has to eat at least two a day." He's wise to take advantage. Wang has a son and granddaughter back in China, and, though the couple is very happy here, Braun says they'll leave eventually. "Ultimately, her future isn't here," he says. "It's over in China where her family is. One day she'll have accomplished whatever her goal is, and then it'll be time to go back." Will he go with her? "Of course! I really look forward to that," Braun says. "I managed to marry into a wonderful family. The original print version of this article was headlined "Love and Hand-Rolled Noodles"